Kingfisher Way - Biggleswade to Tempsford at Biggleswade0845 2033304work Walking RouteThe Kingfisher Way runs from Baldock to Tempsford and has been designed to make use of the Ivel Valley's railway stations allowing the route to be tackled as a whole or in stages. This section, from Biggleswade to Tempsford, provides a perfect introduction to the countryside and wildlife of the valley and passes several nature reserves with opportunities to see wildflowers, birds and insects native to the area. Start Point: Franklin's Mill Biggleswade. From the station follow Station Road Bonds Lane and Mill Lane to Franklin's Mill. End Point: Roxton Lock, Tempsford. The Kingfisher Way runs from Baldock to Tempsford and has been designed to make use of the Ivel Valley's railway stations allowing the route to be tackled as a whole or in stages. This section, from Biggleswade to Tempsford, provides a perfect introduction to the countryside and wildlife of the valley and passes several nature reserves with opportunities to see wildflowers, birds and insects native to the area. 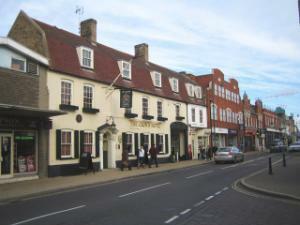 How to get there by car/parking: Biggleswade is just off the A1 to the south of Sandy. Car parking is available at Biggleswade station. If you park in the station there is a fee to pay. Public houses and shops in all towns on route.